Sun., Feb. 11, 2018, 8:43 p.m.
ASHEVILLE, N.C. – The first step in Serena Williams’ comeback underscored how far she has to go after spending over a year away from the game. 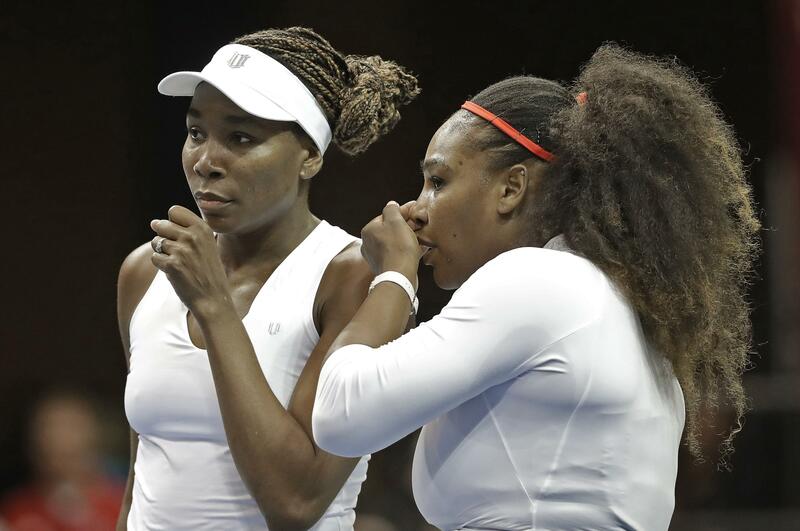 In Williams’ first competition since giving birth five months ago, she and sister Venus lost 6-2, 6-3 to Lesley Kerkhove and Demi Schuurs of the Netherlands in a Fed Cup doubles match Sunday. “I honestly feel better than I thought I was going to feel,” she said. The U.S. already had clinched a victory in the best-of-five event thanks to a pair of singles victories by Venus Williams, so this doubles loss merely narrowed the final score to 3-1. The U.S. advanced to a World Group semifinal April 21-22 at France, which defeated Belgium 3-2 this weekend. The clincher came Sunday when Venus Williams won the final five games in a 7-5, 6-1 victory over Richel Hogenkamp. The U.S. had taken a 2-0 lead Saturday when Venus Williams beat Arantxa Rus 6-1, 6-4 and CoCo Vandeweghe rallied from a set and a break down to defeat Hogenkamp 4-6, 7-6 (6), 6-3. But this event was most notable for the return of Serena Williams, who hadn’t played competitive tennis since winning the 2017 Australian Open while pregnant for her 23rd career Grand Slam singles title, one off Margaret Court’s record. Her only match since had come in a Dec. 30 exhibition. Serena Williams’ daughter, Alexis Olympia Ohanian Jr., was wearing a headband with red and white stripes plus a blue coat Sunday as her father, Reddit co-founder Alexis Ohanian, held her just behind the players’ bench. Williams had said Friday that this weekend would represent “the start of a long process” as she tries to work her way back. Her pregnancy had complications that made this comeback particularly challenging. Williams had told Vogue magazine that she developed several small blood clots in her lungs after her daughter was born Sept. 1. The article said that she was unable to get out of bed for the first six weeks after giving birth. Netherlands captain Paul Haarhuis said a few more matches should help Williams correct the mistakes she made Sunday. Williams’ biggest challenge may be managing expectations as she attempts to work her way back into peak form while balancing tennis and motherhood. Her goals remain as high as ever. Sunday’s scheduled singles match between Vandeweghe and Rus was scrapped because the outcome of this event already has been decided. After Venus Williams’ singles victory Sunday, U.S. captain Kathy Rinaldi said the Williams sisters would be playing doubles together. The schedule originally called for Serena Williams to play alongside Lauren Davis. In other Fed Cup action this weekend, the Czech Republic beat Switzerland 3-1 and Germany beat Belarus 3-2. Germany will host the Czech Republic in the other semifinal. Published: Feb. 11, 2018, 8:43 p.m.